UConn’s School of Nursing has a timeless commitment to wellness and works to provide the exceptional education needed to succeed in this rapidly evolving profession. The School is fully approved, accredited and committed to quality research and public service. Its faculty members advance knowledge through excellence in scholarship and research as they work to remain abreast of the healthcare needs of the world’s diverse population.Grounded in the arts, sciences, and humanities, the School of Nursing, as an integral part of the University of Connecticut, is committed to provide nursing education at the undergraduate, master’s, doctoral, certificate and continuing education levels. The programs are dynamic and respond to changing health care needs. 75 Years of Nursing Excellence! 2012 – The new 15,000-square-foot Widmer Wing addition to the school’s existing space in Storrs Hall opened its doors. The addition includes state-of-the-art classroom and laboratory facilities, including high-tech simulation technologies. 2018 – The School of Nursing begins a new chapter with the arrival of Deborah Chyun from New York University’s Rory Myers College of Nursing as the School’s tenth dean. 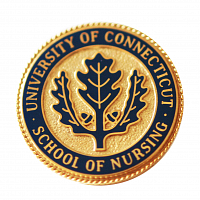 What’s Special About the University of Connecticut School of Nursing? It is Connecticut’s flagship university, nestled in the rolling hills of northeast Connecticut. It is ranked in the Top 20 National Public Universities, and is the only public research university in New England. Its University of Connecticut Health Center in nearby Farmington provides unlimited opportunities for intra- and inter-disciplinary collaboration. The UConn School of Nursing’s expanding support for its research program assists with faculty and student grant development. The UConn Libraries System holdings are 2.5 million volumes with continually expanding Electronic Databases. Researchers will be delighted to find the archives and book collection of Virginia Henderson, internationally renowned nurse scholar, in the Thomas Dodd Research Center. The Josephine Dolan Collection is housed on the second floor of Storrs Hall, with rotating exhibits containing nursing memorabilia honoring the past, informing the present, and enlightening the future. It is the home of Huskymania and student/athlete champions. The School of Nursing, founded in 1942, is located on the main campus in Storrs, Connecticut at 231 Glenbrook Road.Selected courses are offered at the regional campuses. The School is fully approved and accredited. Our programs are supported by well-qualified faculty, many of whom are internationally renowned experts in their areas of specialty. All full-time tenure track faculty members are prepared at the doctoral level. The School has access to adjunct faculty members from a wide variety of agencies in the state to serve as clinical experts and is affiliated with health care agencies within Connecticut as well as many others nationally. Academic Facilities consist of specialized services and resources for students provided in modern facilities, multimedia classrooms, and newly built academic centers. The Homer Babbidge Library is ranked among the country’s top 30 for research resources. It has a strong book collection in nursing as well as the physical and social sciences. Nursing laboratories provide undergraduate students a location to transfer knowledge from theory to practice and graduate students an environment to practice advanced health assessment skills. The School’s Center for Nursing Research facilitates both student and faculty research. The School offers undergraduate, graduate, and certificate nursing programs. View our Fact Sheet here! The School of Nursing’s Mission is to educate nursing scholars, clinicians, leaders, and healthcare consumers through the generation and dissemination of new knowledge developed in innovative scholarship to foster interprofessional evidence-based practice with the goal of advancing the health of individuals, communities, and systems, both locally and globally. The UConn School of Nursing thrives in this setting of 21st century challenge and diversity. Researching dimensions of health and illness for individuals, families, communities and organizations. Educating tomorrow’s Registered Nurses, Advanced Practice Registered Nurses, and Scholars. Nurturing international and cross-cultural understanding. Contributing to health care through faculty practice. Designing innovative approaches to inquiry. Honoring and preserving nursing’s history. Consistent with the metaparadigm of nursing, each person is viewed as a unique dynamic individual interconnected with others and continually interacting and responding with the environment. Environment is the context in which the human experience of health occurs. Humans have culturally derived values and beliefs that give meaning to life and health. Health is a non-linear entity characterized as a matter of personal meaning and interpretation; an ever-changing quality of living and dying influenced by myriad sociocultural, spiritual, economic, physical, developmental and psychological variables. Nursing practice is the convergence of caring elements, ways of knowing, person, health and environment.